The holiday season is in full swing and with that comes stress-induced skin situations. This time of year, I often meet new clients with concerns about dryness and others who want to learn how to cure acne. Over the years, I’ve compiled some of my best skincare and makeup tips to achieve improved skin while camouflaging unwanted blemishes and dullness—both of which can be experienced at any age. While some causes of acne are debatable, there are ways to increase your glow, decrease clogged pores, and maintain your sanity whether you require instant results or those over an extended period of time. Wave your magic makeup wand. In a pinch, makeup can make all the difference in camouflaging breakouts and dullness. Before a makeup application, be sure to prep your skin properly. The following steps will take you through the process of using makeup to conceal acne spots. 2. Apply primer and foundation to diminish the appearance of pores and even the skin tone; blend well. Foundation should be used on all areas of uneven skin tone. 3. Enlist the help of a precision concealer brush to apply a corrective product the same shade as your skin to blemished areas. Some may choose to use their fingers to apply concealer, but I prefer using a clean brush to ensure the product goes where I want it and doesn’t get stuck to the skin on my hands. Blend it in, adding more until you have your desired level of coverage. 4. With a small powder brush, gently press setting powder onto the area to keep the foundation and concealer in place over the pimple. 5. Step back from the mirror occasionally to see how everything looks from afar. If additional coverage is required, you can add more concealer to the area and follow with powder. Remember to gently blend all of your makeup to create the appearance of a flawless face. Makeup is a wonderful tool for instant effects. For a more long-lasting result, whether acne or dullness is a problem, it’s important to develop healthy skincare habits. Establishing a solid skin care routine will undoubtedly ensure a healthier-looking complexion. Skin types may vary, but there are a few things that ring true for all. The most effective way to keep your skin looking and feeling its best is by using gentle and effective cleanser, toner, and moisturizer, twice per day. Since it’s easy to get overwhelmed with the abundance of products on the market, I recommend keeping things simple. · Find a skin type appropriate cleanser that won’t strip the surface. Cleanser stays on the skin for the least amount of time, so choose one that is inexpensive but gets the job done. There are a variety of options to choose from. Gels and foams can be better at cutting down oil than creams and milks. For clear skin, remember to wash off all traces of makeup at the end of the day and follow with toner. · Toner is the second step in your skincare routine and it aids in removing residue left behind from the cleansing process, while also helping to restore your skin’s pH level. There are a variety of toners with a multitude of beneficial properties. Witch hazel is a great middle-of-the-road toner. After cleansing, I recommend dampening some on a cotton round and applying it gently to the t-zone. Follow with moisturizer—even if you’re oily and acne prone. · Whether you’re dry, acne-prone, or any other skin type or condition, it’s imperative that you moisturize your skin daily. This time of year the cold air outside and increased heat indoors can cause the skin to dry out. Even the oiliest skin can become dehydrated, so use an oil free formula. Moisturizer is a product to splurge on because it stays on the skin longer and has more time to penetrate the surface. Look for ingredients like vitamins, antioxidants, hyaluronic acid, and ceramides, which protect the skin, lock in moisture, and help to repair the surface. · Acne and dull skin can be helped by exfoliating once or twice per week. There are two types of exfoliants: mechanical and chemical. Mechanical exfoliants come in the form of scrubs that work as abrasives that lightly buff away dead skin cells, revealing brighter, new skin. These are better for those who have clear skin with only dullness. Chemical exfoliants, like glycolic acid or salicylic acid, help to dissolve the dead skin cells that block pores and lead to acne. This form is highly recommended for acne prone skin because it can be less irritating. · Consult with your dermatologist if you’re on any prescriptions for skin conditions, including acne. If you aren’t on prescriptions, you can find spot treatments that contain thyme extract, tea tree oil, salicylic acid, and sulfur, which have all been known to help with breakouts. Remember to be gentle with your skin, and limit exposure to too many acne-fighting ingredients at once which can strip the skin and do more harm than good. · Remain calm and avoid picking and scratching the skin. Popping pimples can lead to scars, bigger breakouts, and damaged skin. I tell my clients to steer clear of magnification mirrors, which can bring to attention things that are not visible to the naked eye. There are additional things you can do to enhance your skin’s health. It’s no secret; you are what you eat. Many experts believe the key to our best skin is determined by the types of foods and beverages we consume. Our bodies are comprised largely of moisture, so consuming enough water is crucial for feeding thirsty cells and keeping a healthy appearance. Incorporating nutritious foods is another way to keep your body strong, as is participating in regular workouts and limiting unhealthy behaviors such as smoking, excessive drinking, and yo-yo dieting. Ultimately, if you care for your complexion before, during, and after the holidays, you can enjoy what’s truly important in life all year round: being confident in your own skin. 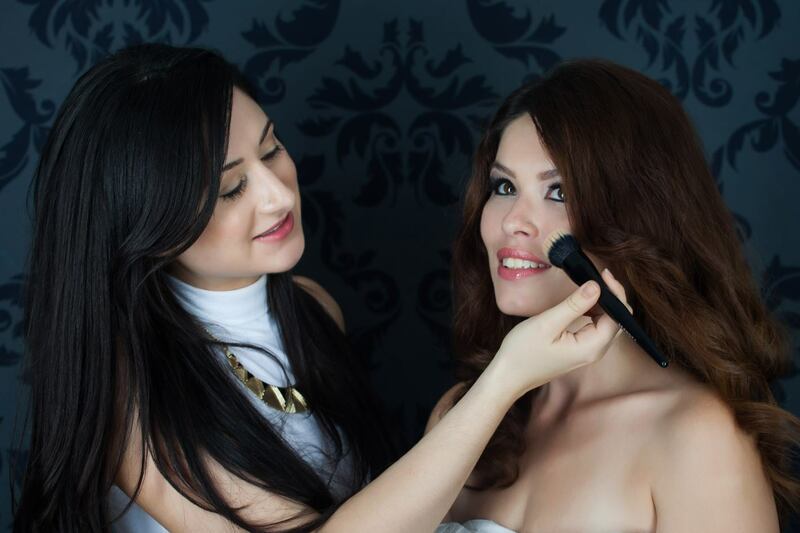 Sara Kosmyna is a licensed eyebrow expert, makeup artist, and founder of Bombshell Beauty Studio and Brows That Wow of New Jersey. Sara is a third generation cosmetologist who has worked among television stars including those on Bravo’s Real Housewives of New Jersey, VH1’s Mob Wives, Style Network’s Jerseylicious and Big Rich Texas, as well as behind the scenes during DC Comic’s All Access web series for Comic Con in New York City. Other noteworthy clients include models, fashion designers, public relations professionals, interior designers, and everyday men, women, and young adults. For more information, visit Facebook.com/browsthatwow. To book your appointment, email BombshellBeautyStudio@gmail.com. How will you be taking care of you skin this holiday season?